"You can't beat the original. 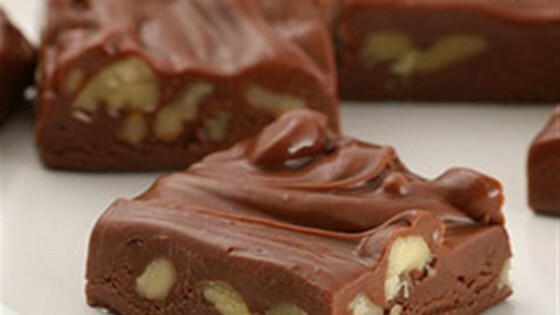 Satisfy your chocolate craving with some Toll House Famous Fudge." I use marshmellow cream and melt with the sugar and condensed milk...It makes the fudge really creamy.. This fudge has a wonderful chocolate taste. If I made it again I would not boil for the 4 - 5 minutes stated in the recipe - it turned out hard. 2 - 3 mintues would make a creamier fudge. I think this turned out great! I used half milk chocolate and half semi sweet chocolate chips. Simple and Easy. Very Very delicious. If you live in the UK, Use castor sugar because granulated sugar is far too coarse and does not give a creamy texture, no matter how long you cook it! This had a really good taste, and was easy to make.